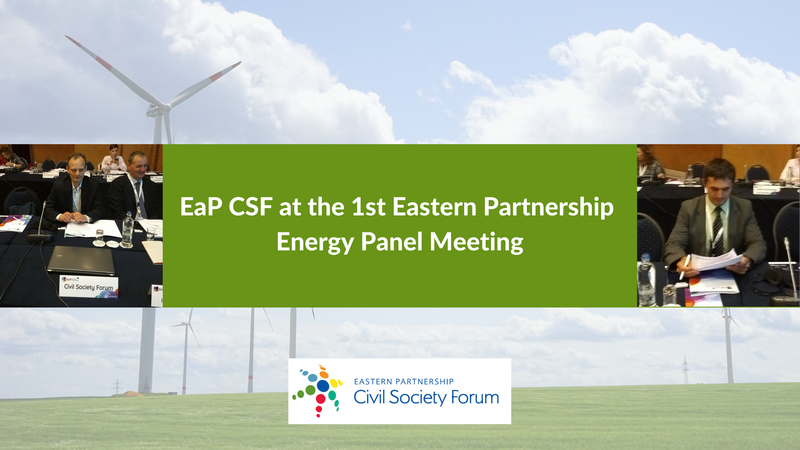 On 5 June 2018, the Energy Panel of the Eastern Partnership Platform 3 ‘Connectivity, energy efficiency, environment and climate change’ met for the first time in Brussels to discuss the new Energy Panel, its working methods including synergies with other EaP multilateral Platforms and Panels. The Eastern Partnership Civil Society Forum (EaP CSF) was represented by Andriy Chubyk, member of the Board of the Foreign Policy Council “Ukrainian Prism” (Ukraine), and Ruslan Surugiu, President of AO Pro Energy (Moldova), who provided feedback and recommendations on behalf of the civil society from the Eastern Partnership region. The Energy panel covers Deliverable 14 (Energy interconnectivity) and Deliverable 15 (Energy Efficiency) of the 20 EaP Deliverables for 2020 roadmap. At the panel, the discussion focused on improving internal working methods, including the nomination of a standing rapporteur that would liaise with the Platform 3; the creation of thematic or horizontal networks, following the example of the Harmonisation of Digital Markets (HDM) Panel; the strengthening of links with other panels, for example with Panel on Research and Innovation; and the improvement of communication at all levels. In particular, it was stressed that all meetings of the Energy Panel should have a working point on communication and that a communication and information network should be established. The Energy Community Secretariat presented a methodology for evaluating the relevance of projects proposed for funding under the EU4Energy initiative. In response to Mr Surugiu it was mentioned that the security of energy supply is a more difficult criterion to monetise, but it has been reflected in the evaluation methodology as an underlying variable.